This article has been published on 6Moons. Reposted here with more pictures and the diagrams. Introduction. An acquaintance pointed me to a circuit diagram published by Sasa Cokic of Trafomatic Audio on the 6moons website as part of a review of Sasa’s Phono Reference One. 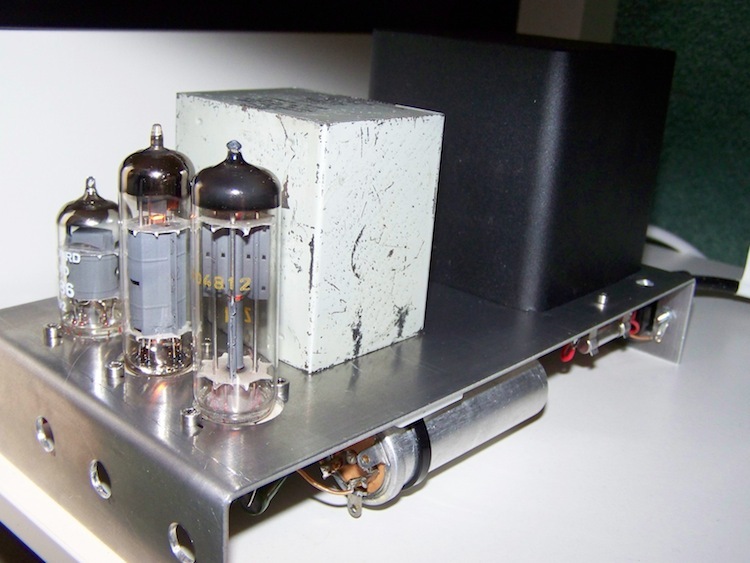 My hobby is designing and constructing tube-based amplifiers. In the published diagram I noticed the remarkable location of the RIAA correction circuit. Usually the RIAA correction is placed between two or more amplification stages. 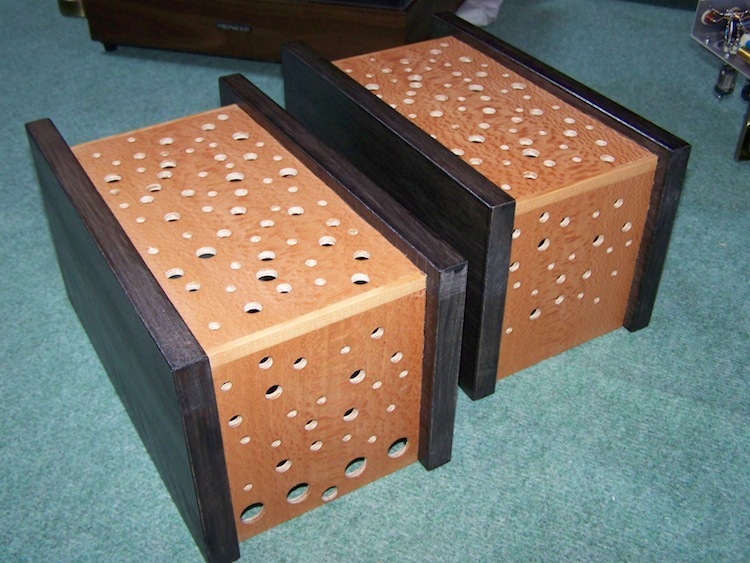 In Sasa’s design the correction is part of the load of the first amplification stage. A second point of interest was that in the first amplification stage there's a pentode not wired as a triode. This way the first stage offers significant gain to the signal which in my opinion is an advantage for the S/N ratio. To come off only requires that the chosen pentode be sufficiently quiet about emission noise. Here the pentode of choice was an EF86 (or EF806) with explicit low-noise specifications. In short, my interest was more than aroused! Getting busy.A quick inventory showed that except for the power supply I could quickly copy the amplifying RIAA correction with available parts on hand. I did swap Sasa’s tube-regulated power supply for a FET-regulated version. This shortened my build time to enable a quicker first assessment of the design. Not much later I was pleasantly surprised by the playback quality of this RIAA amplifier. The phono amp was dead quiet. The only noise came from the cartridge when I turned the volume up. More reason for further experimentation! Contact with Sasa. Before proceeding I sent a mail to Sasa to thank him for publishing the circuit and to congratulate him on the sound quality. In that e-mail I asked Sasa why he did not chose a transformer to load and couple his output stage. The 6N6 tube used is perfectly suited for this because of its low internal resistance. In many of his designs Sasa already uses transformer coupling instead of capacitors. In his prompt reply he was amused to learn about my build of his circuit. The reason why he chose a capacitor and not transformer was to keep the price of the Reference Phono One down. A transformer would have raised the sell price substantially. Sasa then advised me to build the tube-regulated power supply as it far better matches his circuit than any FET-regulated version would. First adjustments. For practical reasons I first replaced the coupling capacitor for a transformer. That was easy and could be done in the existing circuit by swapping a few components. An additional advantage of this adjustment is that the final stage amplifies a bit more due to the fact that the transformer is a more ideal load for a tube than a capacitor. The transformer needs to be of good quality however to play up to the original capacitors. The disadvantage of using a transformer is its vulnerability to EMI radiation from other nearby transformers such as the one in the power supply. With my coupling transformer in place the result was more ease and spontaneity of the playback compared to the previous capacitor. The amplifier sounded even better than it already had. My second adjustment was the replacement of the FET-regulated power supply for Sasa’s tube-regulated version. In order to minimize EMI radiation detrimental to the coupling transformer I built a separate chassis for the power supply. As Morgan Jones once whispered to me, distance is our friend and is cheap. 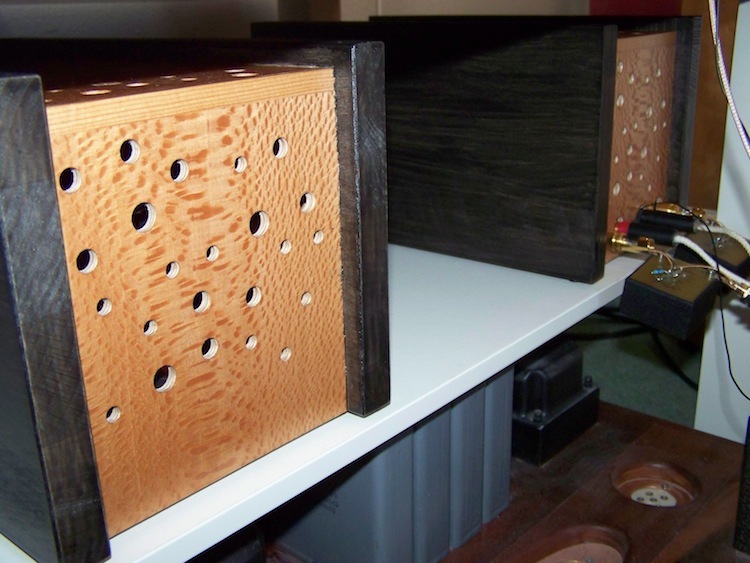 An additional benefit from the separate chassis is that potential vibrations from the power supply transformer cannot reach the sensible input tube via a shared chassis. Again this adjustment led to even better playback. Sasa’s power supply offered more "life" to the music compared to my FET-based supply even though the latter was quieter. Good: Sasa’s circuit with a FET-regulated power supply instead. Better: Sasa’s original Phono Reference One. 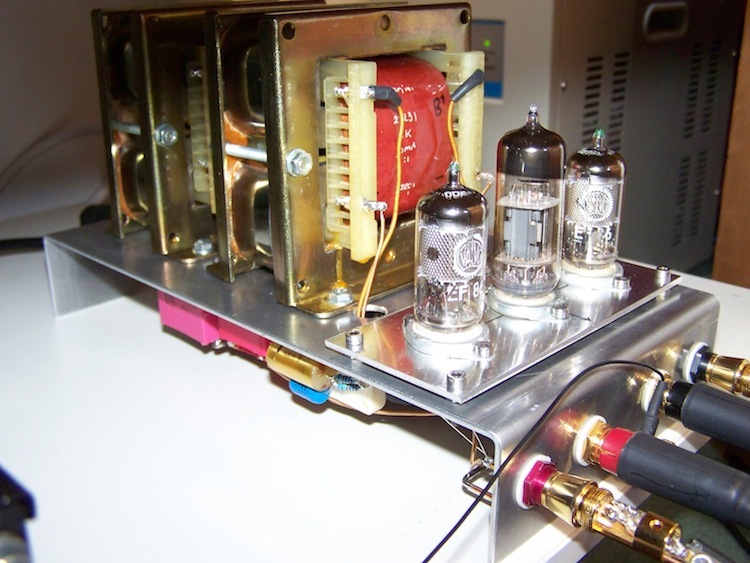 Best: Sasa’s Phono One Reference with coupling transformer to replace the original coupling capacitor. Sasa acknowledged the added value of a coupling transformer and let me know that a Phono Reference One can be ordered from him with such a transformer by request. Cheers. This was the article as posted. 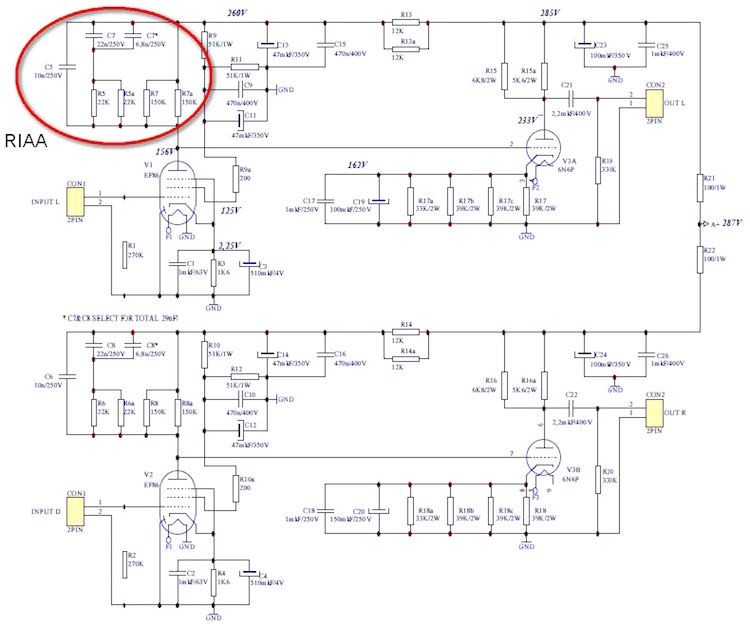 On the next page some photos under the hood of both the FET-supply version and the OPT-version with the diagram.